You would think the company had caught enough heat regarding insensitive marketing from People for the Ethical Treatment of Animals in November for its “Dogfight in Random Alley” hoodie, but apparently the monkey-sweatshirt photo was part of its response to complaints about a lack of diversity in its marketing campaigns in years past. OK. The sweatshirt image caught the attention of New York Times columnist Charles M. Blow and prompted an instant uproar. Many threatened to boycott the Swedish chain after seeing the disturbing advertisement. 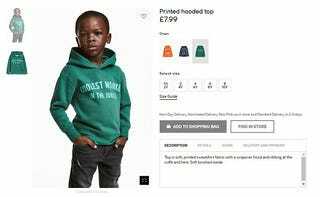 Flocks of customers took to Twitter and Facebook voicing their concerns, demanding that the image be pulled down; others remained on the fence about H&M’s intentions, claiming that the European retailer may be out of touch on such a loaded topic. The use of “monkey” as a racist term has a deplorable history, dating back to the 1570s with the fable of a Portuguese woman being raped by an African ape and being forced to have its babies. Inevitably, some will ignore that loaded history and argue that we live in an overly sensitive society where everything is offensive. And sure, we could simply blame this on poor judgment by H&M’s marketing department. But that’s a tough sell for Black Twitter, which isn’t inclined to forgive so easily. After all, the retailer also featured two other hoodies on white children emblazoned with “Junior Tour Guide” and “Survival Expert”—though all of the hoodies have been pulled from the site. But this is just the latest in a series of affronts by the fashion and beauty industries. Black people consistently remain under attack from careless tactics. In 2017 alone, we witnessed the moment when someone on Dove’s marketing team thought this now infamous advertisement of a black woman transitioning into a white one was a brilliant idea. And how about when American Eagle thought it was genius to make a men’s bracelet reminiscent of slave shackles? Even J.Crew’s brand Madewell felt the burn in November, when staffers didn’t even attempt to style a black model’s hair. But relax, guys ... let’s just ask Kendall Jenner to grab us all a Pepsi. How many more apologies should we expect to hear in 2018 before enough is enough? Or will it remain business as usual, with people of color simply awaiting the next “mistake” to happen at our expense? In the meantime, H&M, a number of artists—whom you should consider hiring—fixed your ad. You’re welcome.